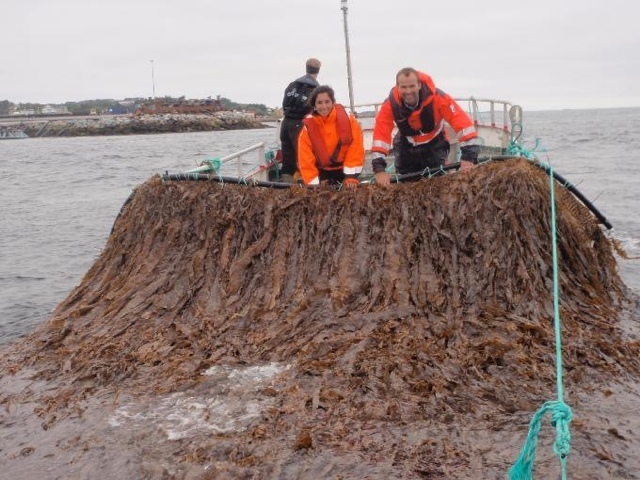 According to Norway's Seaweed Energy Solutions (SES), the strange, foul-smelling brown kelp macroalgae could offer an almost unlimited global supply of commercial-quality ethanol or bio-methane. Kelps are large seaweeds (macroalgae) belonging to the brown algae. They grow in cold, nutrient-rich water - both northern and southern hemispheres - and are among the most beautiful and biologically productive habitats in the marine environment. A dependence upon light for photosynthesis restricts them to clear shallow water and they are rarely much deeper than 20 to 80 feet. While talk of harnessing energy from macroalgae in the U.S. at the moment is often confused with microalgae or simply dismissed by environmentalists afraid of depleting existing wild seaweed populations, Europe seems to be more open toward cultivated kelp’s renewable possibilities. Bakken says Sugar Kelp (laminaria saccharina) can produce about 50 liters of ethanol and 20 cubic meters of biomethane per wet tonne. Although SES has produced both ethanol and biomethane gas during testing, it has yet to commercially market any such bioenergy. SES has a patent on its seaweed carrier, a “large sail-shaped structure” on which to cultivate large numbers of closely spaced macroalgae plants in the ocean itself. With a seaweed breeding facility in Norway, SES is currently conducting cultivation tests off the coasts of Norway, Denmark and Portugal. As Bakken explains, with conventional seaweed cultivation, the plants are ready for harvest six to seven months after its spores (attached to ropes) are put out to grow at sea. These spores, in turn, typically spawn three- to four-meter long plants that normally grow from the surface down to depths of a few meters. And unlike terrestrial crops, which are sensitive to the vagaries of the weather, seaweed is generally unperturbed by normal wind, waves and current. TheGreenMechanics: We have palm oil in abundance in this region, and temperate countries have kelps for a common goal. The possibilities are endless.